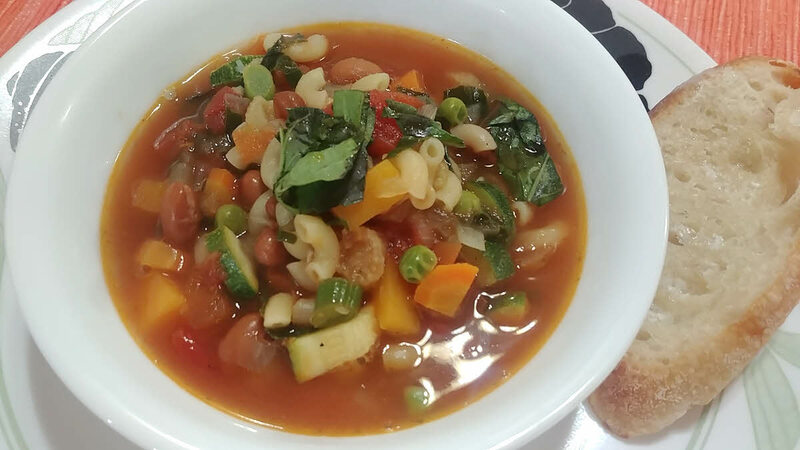 Minestrone soup is my soup of choice during the spring and early summer, when vegetables are at their brightest and most flavorful. Some minestrone soups get cooked down for hours but I actually prefer my quick version, because it keeps the vegetables mildly crisp and fresh tasting. I always start with onion, carrot, celery and canned tomatoes as my base but on top of that, you can use the vegetables suggested here or go with anything. Heat 2 tbsp olive oil in a saucepan over medium heat until shimmering. Add stock, canned tomatoes and beans, with their liquid, and the bay leaves and bring to boil over high heat, then reduce to bare simmer. Cook for 20 minutes, adding the zucchini, squash, green beans and spinach for the last 10 minutes and pasta for the last 5 or 10 minutes depending on the package direction. Season the soup to taste with salt and pepper. Discard the bay leaves, add the peas, cherry tomatoes and basil and stir until the peas are thawed. Serve minestrone soup, drizzling each serving with olive oil.